LasVegasDowntown0043, a photo by JoeDuck on Flickr. In 1951 Benny Binion reopened the Eldorado Club and Apache Hotel, naming the new venue the "Horseshoe Casino" and styling it as a riverboat. Only a few years later Binion was convicted of tax evasion and served about 4 years in Leavenworth. 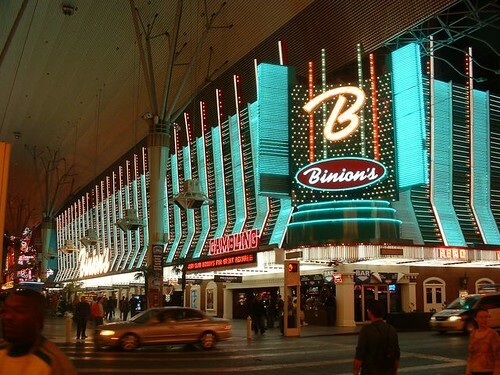 As a convicted felon Binion could no longer own the casino but his family had a controlling interest and he continued as consultant until his death in 1989. In 1970 the World Series of Poker began at the Horseshoe and would eventually create the largest poker tournament series in the world. Daughter Becky Behnen acquired controlling interest in the casino in 1998, but legal conflicts with the culinary workers and bartenders unions led Binions to near bankupcy, leading to a sale to Harrah's in 2004. Vdara Hotel, CityCenter Las Vegas, a photo by JoeDuck on Flickr. The Vdara Hotel and Spa is one of Las Vegas' newest and most elegant venues, part of the CityCenter Complex near the middle of the Las Vegas Strip and home to Vdara, Crystals Retail Shopping Complex, the Aria Resort and Casino, The Mandarin Oriental, and the Veer Towers. Vdara's design is upscale and elegant rather than overly flashy or loud, offering something of a respite from the more hectic Las Vegas lifestyle you'd find in the resort casinos. 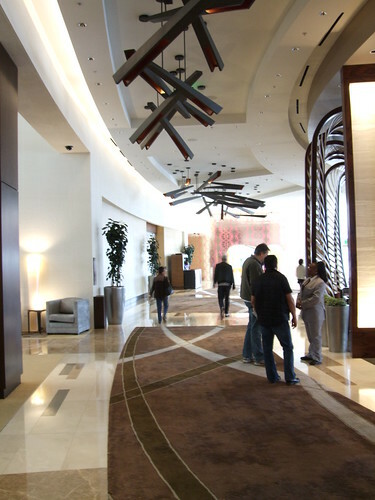 For a little less talk and a lot more action you may want to stay at the Aria Resort and Casino which is right next door - just past the Vdara's very intriguing crashing kayaks sculpture.